GRADE New York: Balance in Design is the first in a series of book projects concerning the work and story of interdisciplinary architecture and design studio GRADE New York. Founded in 2001 by Thomas Hickey with Edward Yedid, GRADE's fullservice practice and holistic approach extends across cultures and continents in order to craft rich experiences of place that are at once sophisticated and striking, yet welcoming and personable, and always leave a strong impression.A former project architect for Robert AM Stern, Hickey's mastery of modernist principles combines with Yedid's multisensory approach to interior design, resulting in an international array of projects that span luxury residencies, eateries and boutique commercial outlets, precisely tailored to the vision of each client. Often taking inspiration from a choice artwork featured within the property, GRADE's coveted interiors use colour, texture, materiality and composition to create a seamless expression of place in the line of Le Corbusier's modernism, which is brought up to date with a distinctively contemporary flair.Featuring exclusive interviews with GRADE's principals, alongside a curated selection of projects that unfold over generous full-page imagery and attention to detail, this publication offers a powerful insight into the philosophy and creative vision behind one of New York's most distinguished design practices. 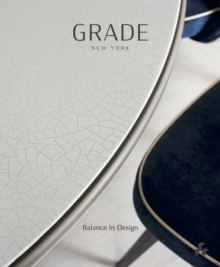 As a true work of craft, GRADE New York: Balance in Design embodies the firm's overarching commitment to curating expressive and inspiring spaces to live and work.